Thank you for making a bicycle that churns butter and generates electricity to power a toaster so that the operator’s labor results in a delicious snack. There is delicious irony <sic> in the dynamics of this piece; the heart benefits from cardiovascular exercise while producing butter – high in saturated fats and linked to coronary heart disease! For me though, just knowing that this work exists warms my heart. It’s super cool that you did your MFA at Cranbrook. I’m a fan of your fellow graduates, Ray and Charles Eames, particularly their work with molded plywood and the movie Powers of Ten. That movie helps me understand perspective of scale and space, which are parts of my every day experience that one tends to take for granted. I think your piece is similar in that butter is a bit magic for most consumers. Your piece, a legitimate waste of time allows people to participate in creating electricity, powering a home appliance, and making a food staple; three things that are both common and a little mysterious. I think that your recontextualized explanation of such aspects of lived experience enhances appreciation of the commonplace and replenishes one’s capacity to wonder. Thanks. The piece is called “a legitimate waste of time” and displayed at FLUXspace gallery through May 2010. 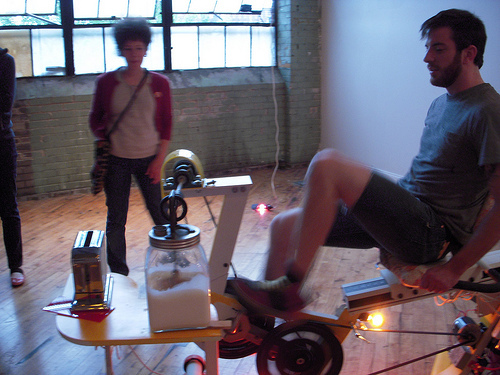 For a really super writeup of the show, see The Art Blog post “churn baby churn”. This entry was posted in Uncategorized on June 26, 2010 by Jason.